TLS, one page, 5.25 x 7, blindstamped personal letterhead, January 12, 1966. Letter to an admirer. In full: “Thank you very much for your birthday greetings. I am, in fact, writing more about the world of The Lord of the Rings, though the time I have to spare, which is not much, is much cut into by my correspondence. I am herewith sending back to you the pictures you kindly let me see. Some of them interested me; none of them enraged me.” In fine condition, with a few light creases. Tolkien’s stories grew to be extremely popular by the 1960s, leading him to be inundated with fan mail. 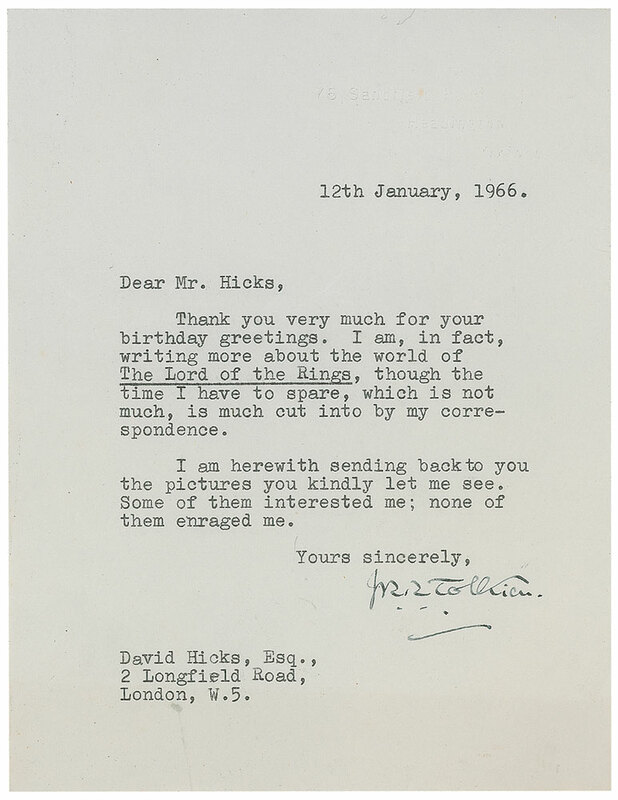 However, he continued to write, publishing The Tolkien Reader and The Road Goes On in the years following this letter. Pre-certified John Reznikoff/PSA/DNA and RR Auction COA.